Today we have rather interesting product for review. 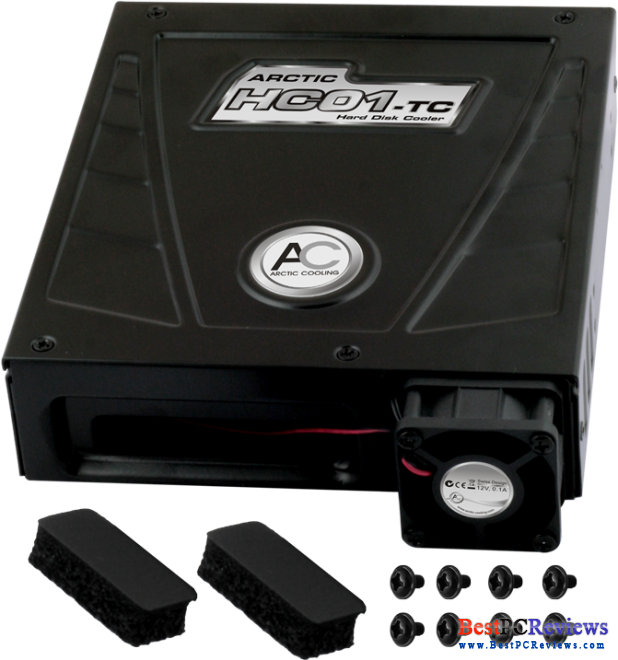 Arctic HC01-TC Hard Drive Silencer and Cooler in one package. 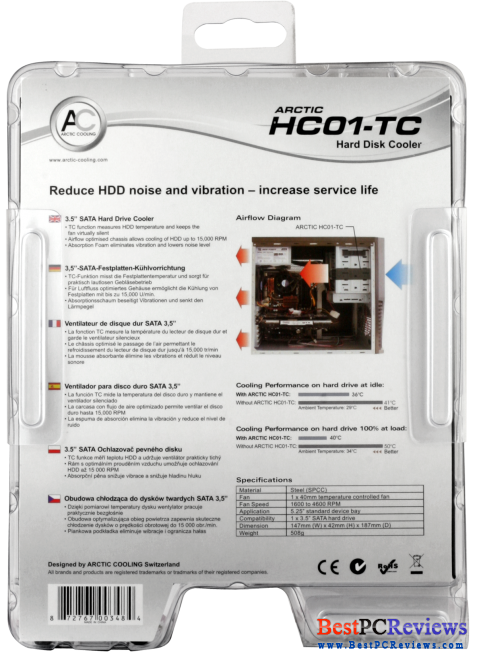 If you want to reduce the noise of your hard drive and cool it down at the same time, this unit might be just for you. As always, we’ll start from packaging. HC01-TC came in rather nice package made of plastic. Inside the package there was the HC01-TC Silencer and cooler, instructions, two foam pieces, and eight screws. Unfortunately installation of this bad boy was a lot more complicated than it seemed like and you will see why. I will guide you through the installation to make it as easy as possible for you. First of all, open the HC01-TC box by taking out four screws on the top of the box. You will see inside bunch more foam pieces. Put your hard drive inside the box. Make sure that you have SATA hard drive because IDE hard drive is not compatible with this device. 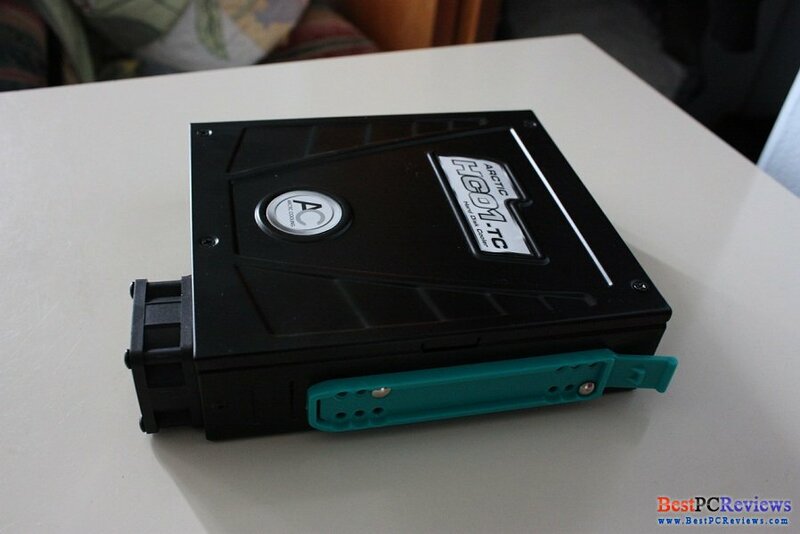 Once you get SATA hard drive on your hands, put it the hard drive so that the connections will be in the back of the box, you will need to connect SATA data and SATA power to your drive through the hole in the box, duh. Now a little bit complicated part, the box comes with special wire that has gauge in the end. That’s for the fan in the box. What the gauge does is checking temperature of your drive and if the drive gets hot the fan start running until your drive will cool down. The little complicated part is its not very clear where to put the gauge. Instruction shows where, but it doesn’t say how. The best option would be is simply find tape and stick the wire to your hard drive. Another complicated part to me was the two foam pieces. From my understanding they are supposed to go to the box cover, but I was not able to glue them to that cover. The foam pieces did have some white tape on them, but when I tried to take the white tape off, there was just the foam, nothing sticky to stick the foam on needed place. What I did was just put the foam pieces on top of the hard drive and put cover on top, securing it with four screws that were mentioned before. As you probably know, this is 5.25” device; therefore, it goes where CD/DVD ROM should go. There are eight screws included to secure the device to your case, but I used rails that came with my case. 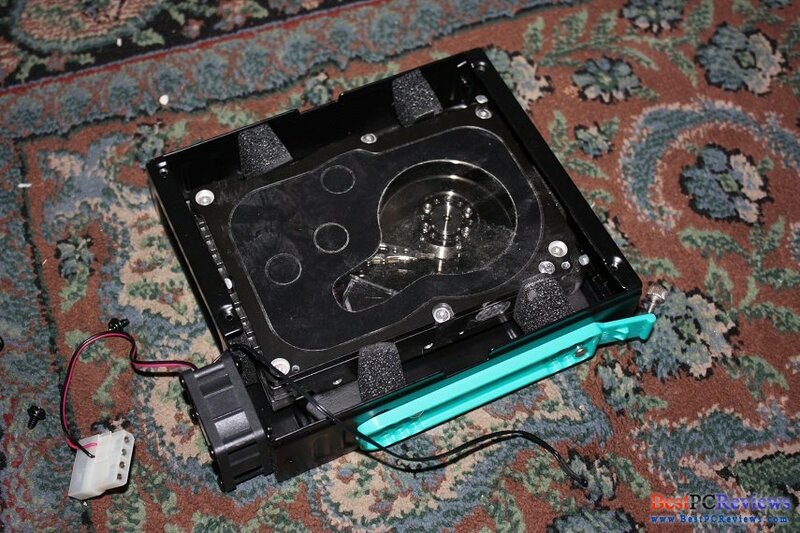 Most modern computer cases come with rails for hard drives and DVD drives, so be sure to use rails as it is a lot easier to put devices in and out with the rails. Now comes very complicated part. It’s time to connect SATA data and SATA power cables to your hard drive. 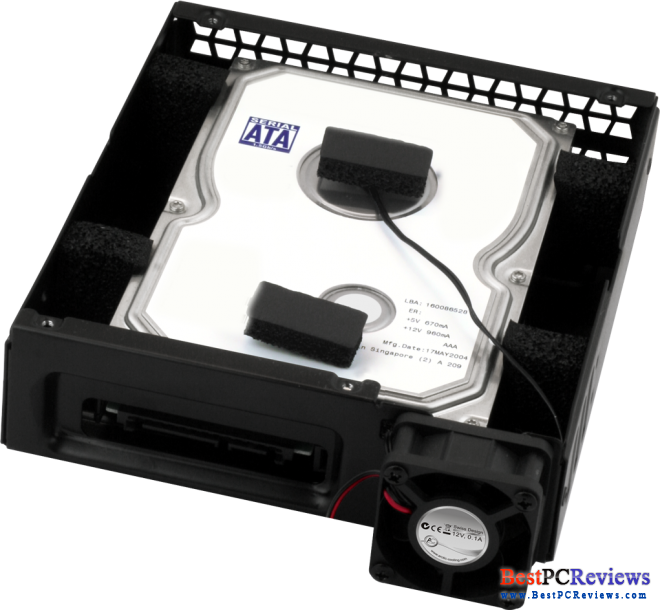 It will be not be easy since the hard drive will slide away from you because of the foam material surrounding your drive. 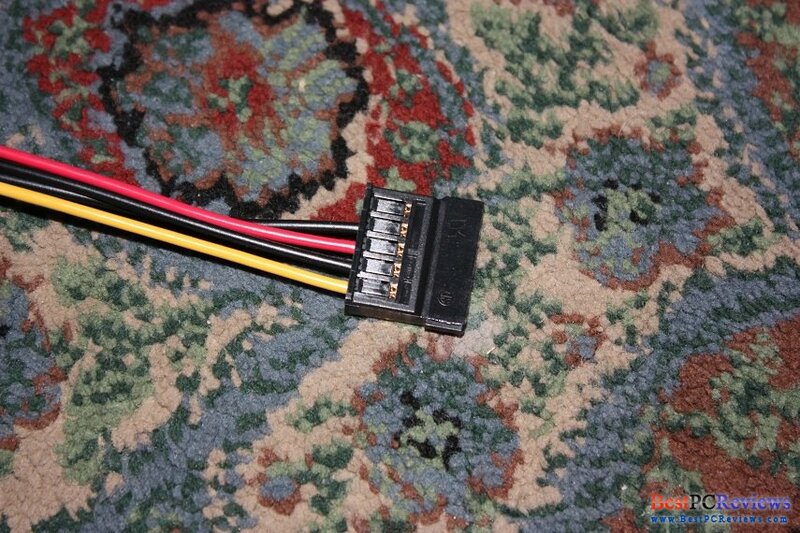 However, the worst part is if you have right angle SATA data cable, it WILL NOT WORK. Be sure you have straight SATA data cable before even starting whole installation. On top of that, I had the same problem with connecting SATA power cable. Fortunately I had Molex to SATA cable; I used it as this cable had straighter SATA connection. 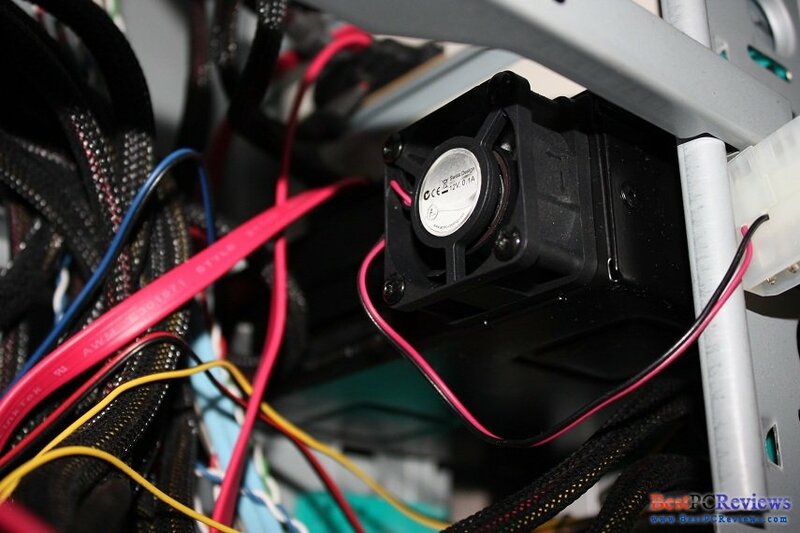 Since you have to do the connection inside the case, tons of wires might give you some trouble doing these two connections; however, if you have needed SATA power and data cables, it can be accomplished pretty fast. After you connect power and data to your hard drive, it’s time to connect your Hard Drive fan to your power supply. Molex connection is needed for this operation and every power supply has Molex cables. If yours does not, throw it away immediately and get another power supply. Now close your case and connect everything so that you can start your computer. You’re done. Now speaking of noise, you are not going to feel a lot of noise reduction. 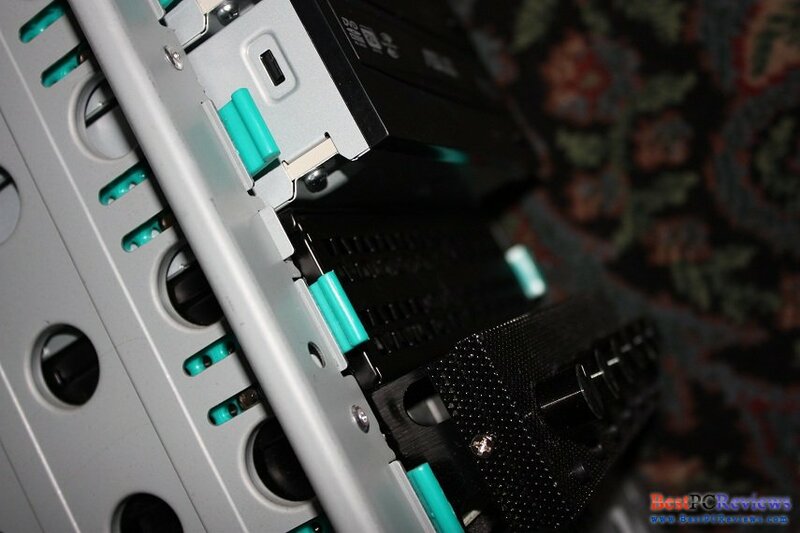 Most modern computer cases will never produce noise from hard drive vibration; however, if you have computer that was built from times of Pentium 1 or may be even Windows 95 then you might feel your computer’s noise reduction because of vibration of hard drive. Hard Drives do produce other noise, not vibration, but noise coming from inside the hard drive, but it’s very quiet compared to your Power Supply, CPU, and Video card. Noise of your hard drive will be much less now not because of the foam pieces inside the box, but because of the box it as it will hold most of the noise. 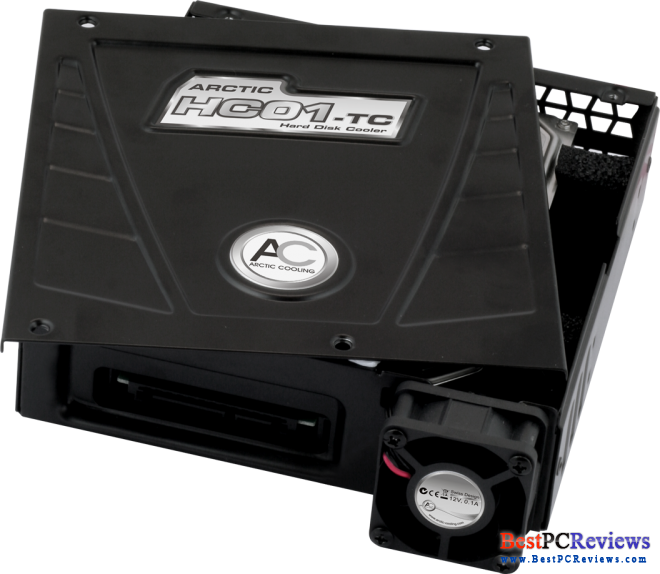 Speaking of fan and airflow, Arctic HC01-TC did a great job at it. There are openings at the front of the case for good amount of air to come in and fan in the back does a great job taking hot air out. This is great air circulation that will keep hard drive cool. Currently, the unit cost $23.80 at the official site. That’s a good price for the product. 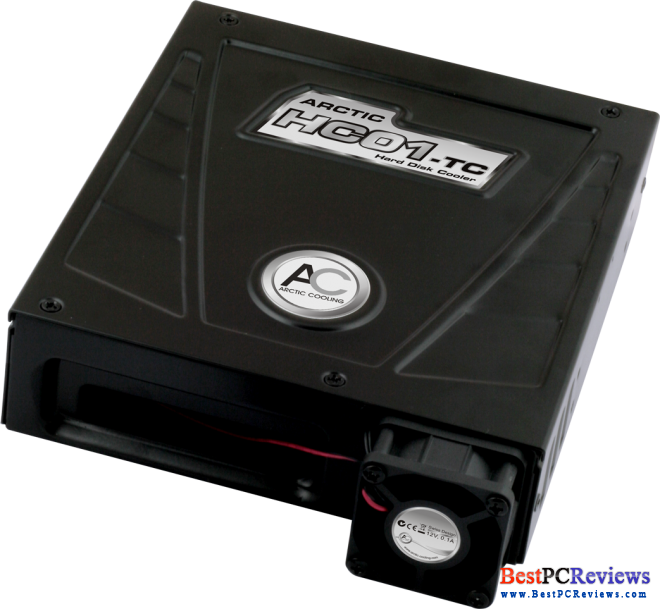 It will be a good buy, but just be sure to have SATA power and data cable that will fit in the rear of the box. If you are not sure if your cable will fit, let me know, ask here and give me a link with a picture to your cables.